Moscow is a big, bustling city with an estimated population of around 15 million people. For most travellers, the thought of navigating a city of this size can be pretty daunting especially when you add to this that most foreign visitors to Moscow don’t speak or read Russian. With that being said, I doesn’t have to be an intimidating or uncomfortable experience. With a bit of pre-arrival research using this Getting Around Guide you’ll arrive feeling confident and be getting around Moscow like a local in no time at all. Moscow is serviced by five airports, Sheremetyevo International, Domodedovo International, Bykoyo, Ostafyevo International and Vnkovo International. Sheremetyevo and Domodedovo are the most common entry points for international visitors with the other airports mostly being used for domestic flights and flights to/from former Soviet states. For this article I will focus only on the two main airports as most people are unlikely to come across the others. Shermetyevo is located about 29km northwest of the centre of Moscow and is the busiest of Moscow’s airports, handling around 60% of the cities incoming and outgoing visitors. There are six terminals, A to F, with four being used for regular passenger planes. Each passenger terminal is fully equipped with the usual amenities you find in airports with no fancy bells and whistles like some of the other airports around the world. Aeroflot is the main airline that operates out of Shermetyevo but there are another 30 odd airlines that also have at least one weekly departure and arrival, mostly to destinations in Europe and a few in Northern Africa, China and USA. 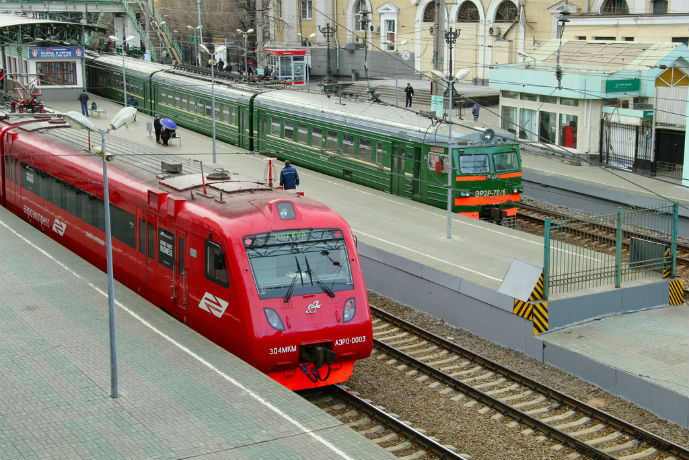 There is a Aeroexpress train service that departs from Terminal F (shuttle buses take you from the other terminals to Terminal F) and is express to Belorussky Station in Central Moscow. The first and last services depart Shermetyevo at 5:00am and 12:30am and depart Belorussky at 5:30am and 12:30am respectively. Trains depart every 30 minutes with a journey time of about 35 minutes. Tickets cost 400 RUB and can be purchased from the ticket windows at either the Airport Station or Belorussky Station, depending on where you are starting your journey. 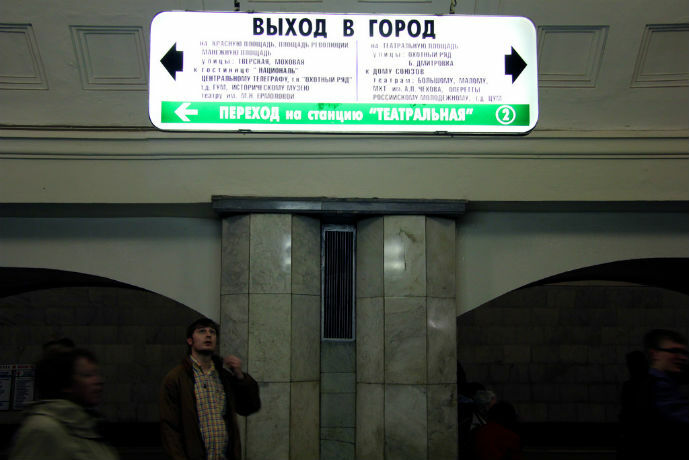 Once you arrive at Belrussky Station you will find it is well connect to the Metro. You can take both line 2, which cuts thought the centre of the city, or line 5, which does a circle of the city. There are also taxis and shuttle buses available at all terminals but this isn’t a recommended option as the road leading from Shermetyevo is notoriously bad for traffic. I’ve read that it can sometimes take over an hour just to get a few kilometres from the airport. If you do decide to use these options, you will find booking counters in the arrivals area of all terminals. Domodedovo is located about 42km southeast of the centre of Moscow and is the largest but second busiest of Moscow’s airports. There is just one terminal which is split in two, one side is international and the other domestic. Both sides are fully equipped with the usual amenities you find in airports with no fancy bells and whistles like some of the other airports around the world. There are around 50 airlines that have at least one weekly departure and arrival, mostly to destinations across all of Asia and a few places in the Middle East, Northern Africa, Europe and USA. There is a Aeroexpress train service that departs from outside the terminal and is express to Paveletsky Station in Central Moscow. The first and last services depart Domodedovo at 6:00am and 12:00am and depart Paveletsky at 6:00am and 12:30am respectively. Trains depart every 30 minutes with a journey time of about 45 minutes. Tickets cost 400 RUB and can be purchased from the ticket windows at either the Airport Station or Paveletsky Station, depending on where you are starting your journey. Once you arrive at Paveletsky Station you will find that it is well connect to the Metro. You can take both line 2, which cuts thought the centre of the city, or line 5, which does a circle of the city. There are also taxis and shuttle buses available at all terminal but again, traffic is an issue (although not as much as Shermetyevo) so the recommended option would be to take the train. If you do decide to use these options, you will find booking counters in the arrivals area. 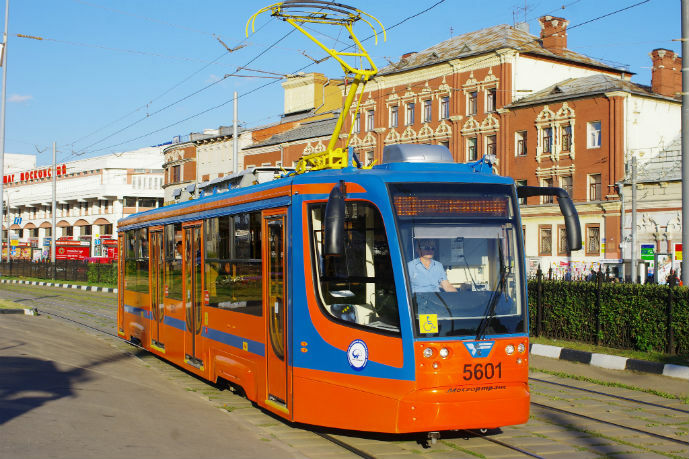 Moscow is serviced by Metro, buses, trolleys, trams and taxis. With the amount of congestion above ground, your best option for getting around is using the Metro and only using the other forms of transport when absolutely necessary to avoid wasting your precious time in traffic jams. There are currently around 195 Metro stations stretching from the city centre out to the furthest reaches of the city. The Metro is made up of 12 lines with each line being assigned a colour and number from 1 to 12 making it simple to identify on a map and on the display boards at the stations. 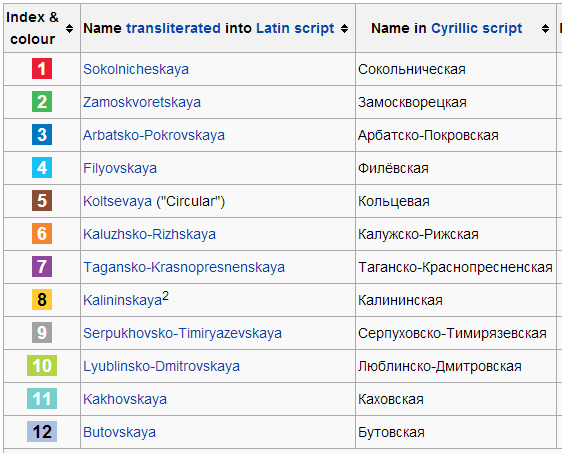 Table above, taken from Wikipedia, shows the line numbers, colours and line names written in both Latin and Cyrillic. There are very few, if any, signs in English but this doesn’t mean that the Metro is impossible to master for people who can’t read or speak Russian. 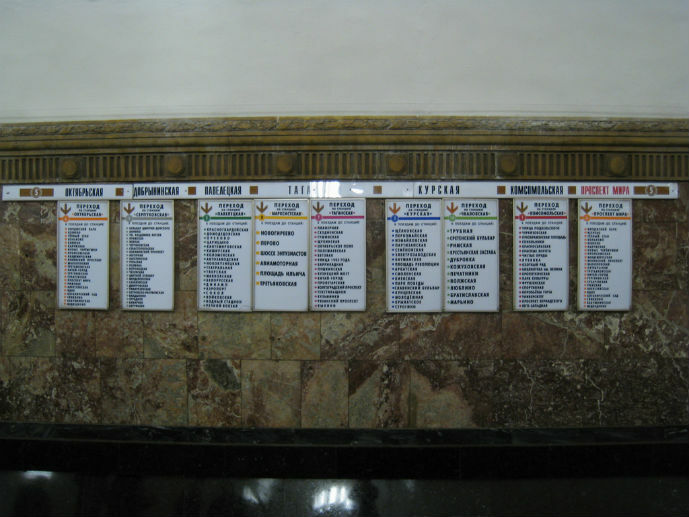 The colours and numbers will be helpful to you on you first few journeys and then as you get use to the Cyrillic script, you will notice that you begin you know what some of the signs say and be able to identify station names in both Latin and Cyrillic by matching them to a good map. Services run from around 5.30am to 1.00am the next morning with some stations having slightly shorter hours. If you don’t want to miss the last Metro, try to ensure you are on a train by 12:30am. The peak times are generally the same as elsewhere in the world, 8:00am to 9:30am and 5:00pm to 6.30pm. While services run as close as every 90 seconds during these times, they are still very overcrowded and it is advisable to avoid travelling between these hours. Outside of peak times on popular lines you may still find it crowded but you will also find that services run every few minutes, so waiting for the next service won’t cause you too much time wasted. On the Moscow Metro you have the option of purchasing ordinary tickets or a smart card, similar to the one used in London and other major cities around the world. Tickets and smart cards can be purchased from the ticket windows and vending machines at the stations. The choice of which type of ticket to purchase is really up to you. You need to think about how far away your accommodation is to the main sights, how much you like to walk when you travel and how long you will be spending in the city. 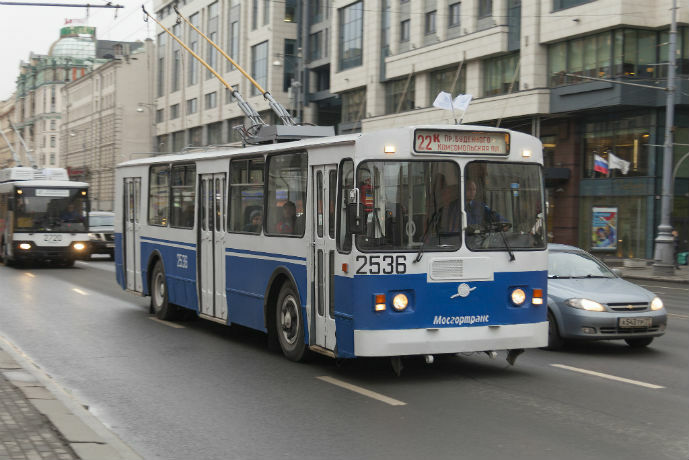 For example, if you are staying in an area about 30 minute’s walk from Red Square, you don’t like to walk too much and you’ll be in the city for 5 days, I would recommend the 11 ride ticket as this allows you at least 2 trips on the Metro each day. Tickets are checked only on entry and exit of the station at the ticket gates and allow you unlimited transfers between lines. Hefty fines apply for fare evasion, so I strongly suggest you don’t try hopping the barriers just to save a few bucks (or rubles). 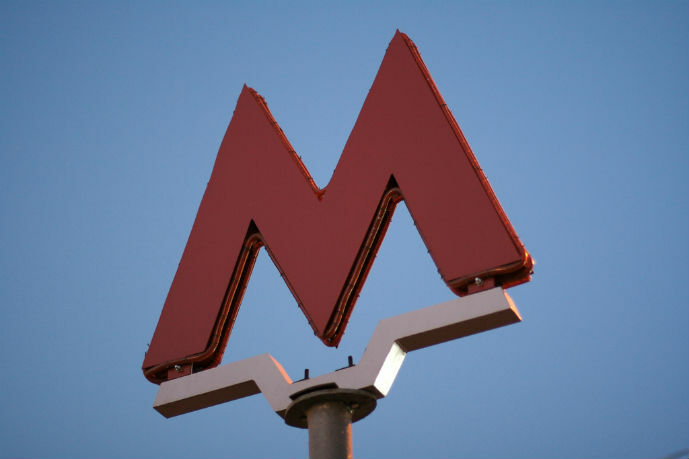 All Metro stations are marked on street level by a big M making it simple to identify from a distance. Most of the major stations in the city centre will have more than one entry and exit onto the street. 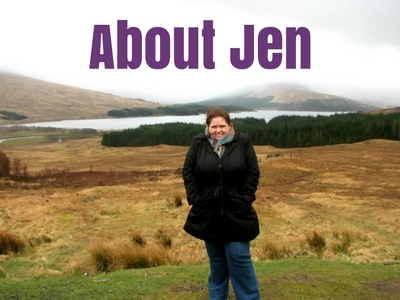 You will find that in the city centre, you’re no more than a few hundred metres from an entrance most of the time. As I mentioned earlier, there are no signs in Latin in the stations or on the platforms. The easiest way to find your platform is to look for the numbers and colours on the overhead signs. Once you are on the platform you will need to determine which direction you need to travel in. To do this consult your map to match the Cyrillic wall signs above the tracks showing which stations are next, with the station names in Cyrillic and Latin on your map. It will be challenging at first, but I guarantee after 24 hours you will recognise Cyrillic letters and find navigating the Metro easier. It is likely that you will go in the wrong direction once or twice, so try to see it as an adventure and all part of the fun of travel. Once you are on the train there is very minimal signage to tell you when you have arrived at your stop. There is announcements in Russian which may be tricky to understand for a first time visitor. I suggest counting the number of stops on your map before boarding the train and then counting each stop the train makes when you’re on-board to ensure you get off at the right stop. Safety is an issue when travelling on public transport all around the world. Moscow is no exception. 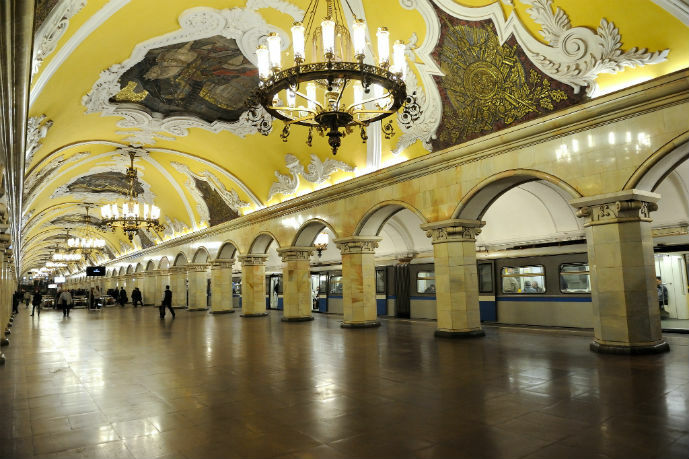 While Moscow’s Metro is clean and relatively safe, it is important that you remain alert at all times. 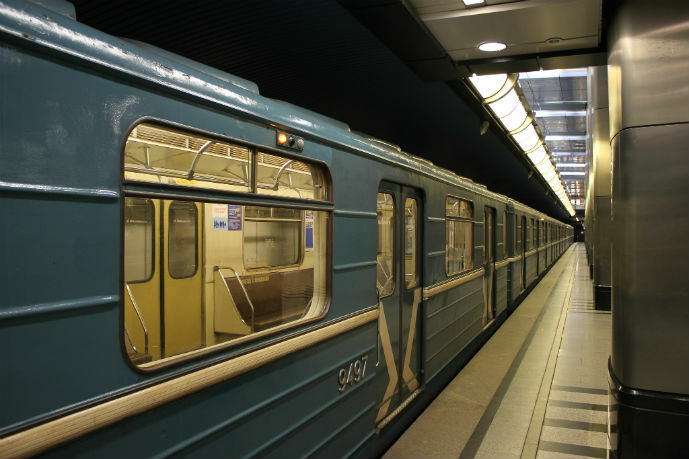 Keep your belongings close to you with your backpack on your front and nothing valuable in your pockets, prepare to be pushed and squashed as people get on and off and hang on tight as the Moscow Metro goes quite fast and stops just as quick. Pickpockets love crowded trains, platforms and escalators. 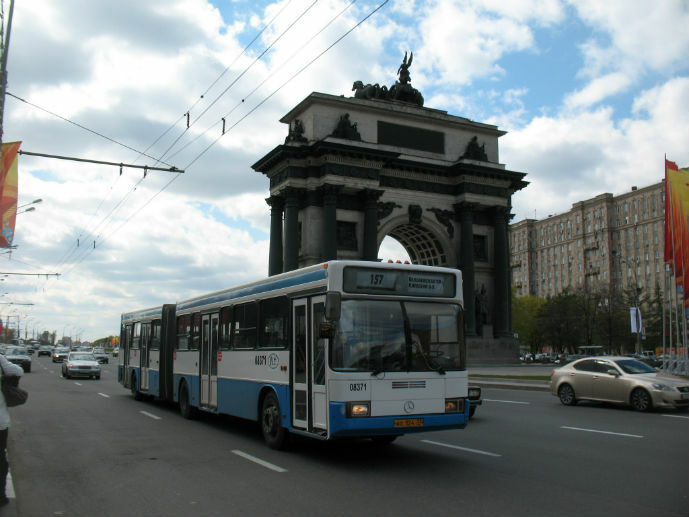 Due to the terrible traffic congestion in Moscow, I would only advise using the bus, trolley or tram if the Metro is unavailable or the place you are trying to reach is not serviced by the Metro. They all run throughout the city from 5:30am to 1:00am the next morning just like the Metro. The peak times are generally the same as elsewhere in the world, 8:00am to 9:30am and 5:00pm to 6.30pm. Services usually don’t run to schedule, so expect to wait anywhere from a few minutes up to 30-40 minutes between services. As with the Metro, you can either purchase individual paper tickets for one or more journeys or purchase a smart card. Tickets can be purchased on board the bus, trolley or tram or you can purchase them from the booths near some of the stops at a slightly cheaper price. You will find bus stops are marked by yellow signs with an “A”, trolleys by white signs marked with “T” and trams are white signs also and marked with “Tp”. At bus and trolley stops, line numbers and destinations are indicated on the sign. Most buses, trolleys and trams are to be boarded through the front door so you can put your ticket through the machines to be validated. Once you’re on board, stops are announced loudly in Russian only and there are route maps on the walls of the bus to help you find when you need to get off. If you are unfamiliar with the language and the area, I would suggest using this journey planner to figure out how many stops until you need to get off and then count as you go. A taxi in Moscow is basically any vehicle. It is legal for anyone with a car to stop and pick up strangers charging a negotiated fee. This probably sounds bizarre and unsafe to most people around the world but in Moscow it works. That being said I wouldn’t recommend doing it because really, you don’t know who is going to pick you up. It’s really up to you how much you like to step out of your comfort zone when travelling. 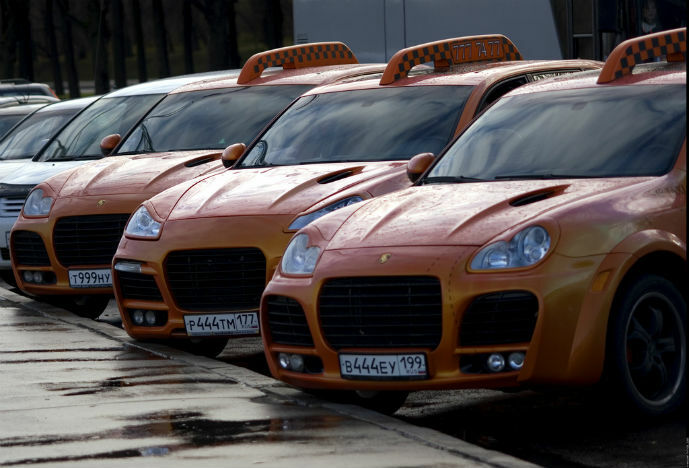 For those who prefer licensed taxis there are plenty of those in Moscow too. They can be booked, flagged down on the street or pick up at certain points throughout the city like train stations and popular attractions. Most drivers don’t like using the meter, so make sure you negotiate a fee and bargain with them as soon as you get in the taxi to avoid being ripped off. Rates at night are higher. 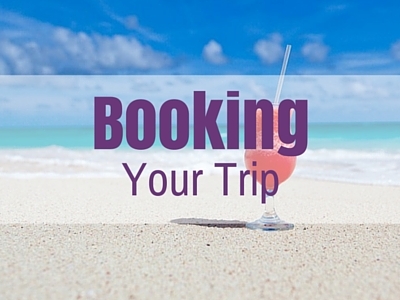 Bookings can be made online at each taxi companies website or easier, you can book taxis at the reception of your accommodation. 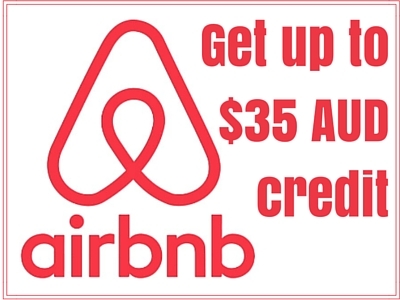 They will have a taxi company that they use regularly and be able to quote you with an approximate price before booking. The biggest problem with using taxis in Moscow is the traffic and the fact that they charge based on time. Unless you manage to negotiate a fare before getting in, you just never know how long your journey will take and how much it will cost at your destination. I recommend only using taxis when other forms of transport like the Metro are simply not an option. Such a helpful guide! With the Cyrillic alphabet and lack of English spoken, I’ve always been a bit intimidated to navigate Russia on my own, but this makes it sound doable. 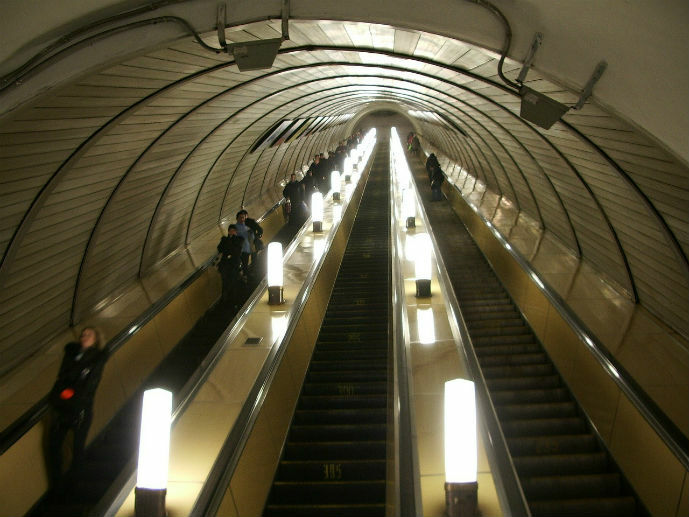 I’d love to see the metro in Moscow someday – it looks gorgeous. The metro in St. Petersburg was incredibly ornate too, but I didn’t get to see as much of it as I’d like. If you’ve been to St Petersburg I think you will be fine in Moscow. Love the metro stations too!